Venice is known for historic sites, nature, museums, nightlife, and shopping. Your plan includes some of its best attractions: explore the activities along Canal Grande, get the lay of the land with Walking tours, explore the world behind art at Gallerie dell'Accademia, and take in panoramic vistas at St Mark's Campanile. For ratings, more things to do, and tourist information, read our Venice online driving holiday planner . Milan to Venice is an approximately 2.5-hour train ride. You can also drive; or take a bus. August in Venice sees daily highs of 34°C and lows of 22°C at night. Finish your sightseeing early on the 13th (Mon) to allow enough time to travel to Mykonos Town. 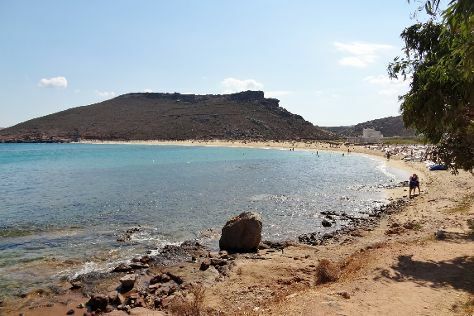 On the 14th (Tue), make a trip to Rarity Gallery, then make a trip to The Windmills (Kato Milli), then enjoy the sand and surf at Paradise Beach, and finally tour the pleasant surroundings at Panormos Beach. For traveler tips, other places to visit, and tourist information, go to the Mykonos Town online tour itinerary planner . You can fly from Venice to Mykonos Town in 5 hours. Other options are to do a combination of train, bus, and ferry; or do a combination of bus and ferry. Due to the time zone difference, you'll lose 1 hour traveling from Venice to Mykonos Town. Traveling from Venice in August, you can expect nighttime temperatures to be somewhat warmer in Mykonos Town, with lows of 27°C. Cap off your sightseeing on the 14th (Tue) early enough to travel to Istanbul. Istanbul is known for historic sites, museums, shopping, nature, and nightlife. Your plan includes some of its best attractions: get engrossed in the history at Hagia Sophia Museum / Church (Ayasofya), explore the world behind art at Kariye Museum (The Chora Church), delve into the distant past at Basilica Cistern, and admire the landmark architecture of Dolmabahce Palace. To plan Istanbul vacation without wasting time, ask Inspirock to design an itinerary. You can do a combination of flight and train from Mykonos Town to Istanbul in 2.5 hours. Other options are to do a combination of ferry and bus; or do a combination of ferry and car. Traveling from Mykonos Town to Istanbul, you'll lose 1 hour due to the time zone difference. In August, daytime highs in Istanbul are 34°C, while nighttime lows are 25°C. Finish up your sightseeing early on the 17th (Fri) so you can travel to Goreme. Kick off your visit on the 18th (Sat): stop by Alaturca Carpet, then explore the fascinating underground world of Cappadocia Cave Dwellings, and then enjoy unforgettable views with a balloon tour. To find where to stay, maps, traveler tips, and other tourist information, use the Goreme online tour builder . You can do a combination of flight and taxi from Istanbul to Goreme in 4.5 hours. Alternatively, you can do a combination of bus, flight, and taxi; or drive. When traveling from Istanbul in August, plan for a bit warmer days in Goreme, with highs around 38°C, while nights are a bit cooler with lows around 19°C. Wrap up your sightseeing on the 18th (Sat) to allow time to travel to Selcuk. Start off your visit on the 19th (Sun): delve into the distant past at Celsus Kutuphanesi, explore the ancient world of The Terrace Houses, then steep yourself in history at Ancient City of Ephesus, then explore the ancient world of Efes Antik Kenti Tiyatrosu, and finally pause for some serene contemplation at Meryemana (The Virgin Mary's House). For traveler tips and other tourist information, use the Selcuk trip planner . Traveling by combination of taxi, flight, and train from Goreme to Selcuk takes 6 hours. Alternatively, you can do a combination of bus, flight, and train; or drive. Plan for somewhat warmer nights when traveling from Goreme in August since evenings lows in Selcuk dip to 26°C. Finish your sightseeing early on the 19th (Sun) so you can travel to Athens. Athens is known for historic sites, museums, shopping, nightlife, and fun & games. Your plan includes some of its best attractions: explore the ancient world of Acropolis of Athens, admire the masterpieces at Museum of Cycladic Art, get engrossed in the history at National Archaeological Museum, and get great views at Mount Lycabettus. To see maps, traveler tips, where to stay, and tourist information, read Athens trip planner. Getting from Selcuk to Athens by combination of train and flight takes about 4.5 hours. Other options: do a combination of taxi and ferry; or drive. The time zone difference moving from Eastern European Time to Eastern European Time is minus 1 hour. August in Athens sees daily highs of 39°C and lows of 29°C at night. Finish your sightseeing early on the 22nd (Wed) to allow enough time to travel to Heraklion. Kick off your visit on the 23rd (Thu): explore the ancient world of The Palace of Knossos, then take an in-depth tour of Heraklion Archaeological Museum, then learn more about the world around you at The Natural History Museum of Crete, and finally take in the architecture and atmosphere at Church of Saint Titus. To see more things to do, ratings, traveler tips, and other tourist information, use the Heraklion holiday planner . You can do a combination of subway and flight from Athens to Heraklion in 3 hours. Alternatively, you can do a combination of taxi and ferry; or ride a ferry. While traveling from Athens, expect slightly colder days and about the same nights in Heraklion, ranging from highs of 34°C to lows of 26°C. Finish your sightseeing early on the 23rd (Thu) to allow enough time to travel to Oia. 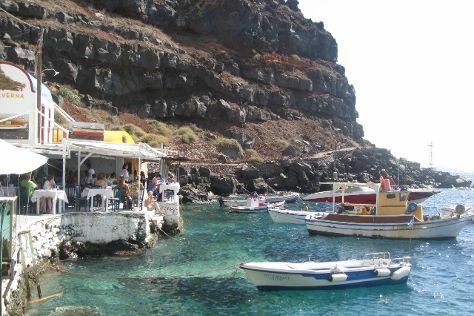 Kick off your visit on the 24th (Fri): hike along Hiking Trail Fira - Oia, take some stellar pictures from Sunset in Oia, and then contemplate the waterfront views at Amoudi Bay. Get ready for a full day of sightseeing on the 25th (Sat): look for gifts at Sand Lily Boutique, explore the ancient world of Akrotiri, and then get interesting insight from Tours. For maps, where to stay, photos, and more tourist information, refer to the Oia road trip planner. Traveling by ferry from Heraklion to Oia takes 2.5 hours. Alternatively, you can fly. In August, daily temperatures in Oia can reach 36°C, while at night they dip to 28°C. Wrap up your sightseeing on the 25th (Sat) early enough to travel back home.